A New York-based developer is working on a piece of hardware that allows you to "feel" the Oculus Rift's virtual reality worlds. The FeelReal fastens to virtual reality devices like the Oculus Rift, Samsung Gear VR, Sony Morpheus, and Zeiss VR One. 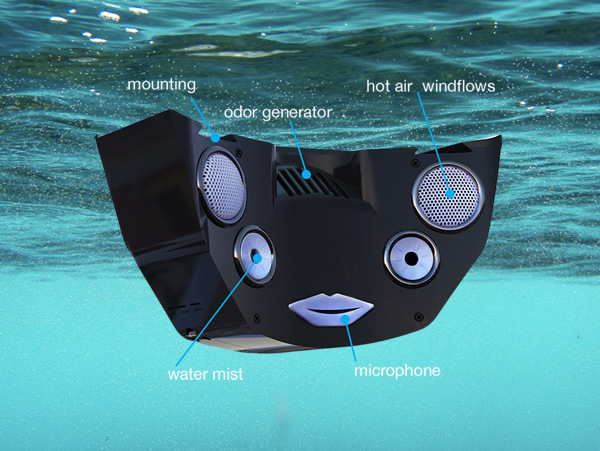 The attachment clips to the bottom of your VR headset, putting your nose, mouth, and cheeks within range of the sensation-inducing nozzles. Once you're strapped in, the gadget goes to work, blasting your face with bursts of hot and cool air. When you're next to a virtual fire, you actually feel the heat. And when you're near a virtual waterfall, a pair of sprinklers squirts water onto your face. And, to top it off, a collection of odor cartridges shoot scents into your nearby nostrils. Right now, FeelReal is in a testing phase. The developer hasn't revealed a pricing plan or a release date. Though, the company is currently accepting pre-orders, and you can buy branded t-shirts. Haven't you always wanted a t-shirt that says "FeelReal"? As VR technology inches ever closer to the consumer market, third-party hardware developers are scrambling to attach themselves to the gaming industry's latest obsession. But designing a peripheral for another peripheral isn't exactly a straightforward process. And the fact that gamers haven't really accepted virtual reality makes the problem even more difficult. So, it's really no surprise that we're seeing experimental pieces of hardware piggybacking on virtual reality devices like the Oculus Rift. But this isn't the first time that a company's tried to cash in on our olfactory senses. Back in the 1960's, a German movie technician named Hans Laube installed a mile of plastic tubing under Chicago’s Cinestage Theatre. The tubes acted as a delivery system for a combination of 30 odors that would be triggered by the movie's sound track. Laube called it "Smell-O-Vision." It was only used for one movie. FeelReal is giving me a real Smell-O-Vision vibe. The Virtual Reality headgear already feels claustrophobic, and when you strap an extra piece of hardware to the player's face, its downright oppressive. Plus, are gamers really going to replace those little cartridges when the smells run dry? Or will the FeelReal just find its way to the back of the closet, doomed to spend eternity in a box with the Sega Activator and every single Wiimote accessory?